A tribute to the British Merchant Navy - they also served! 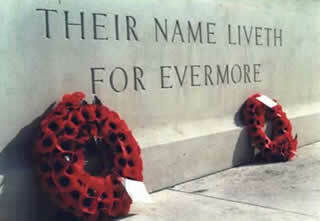 We honour them by remembering. If you can make a connection with this ship. This page is dedicated to the Asiatic crew who gave their lives. 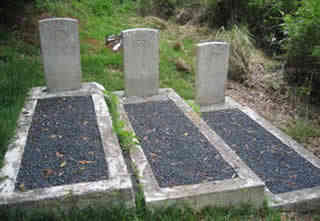 Below right are the graves of the Lascar seamen buried on St Helena. 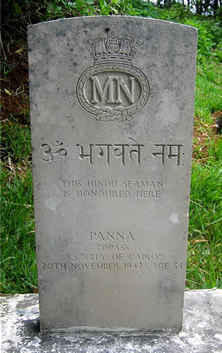 Ranno Panna died 20th November 1942, Age 34. Sultan Khan died 7th February 1943, Age 40. The bodies of two Lascar seamen who were landed by ss CLAN ALPINE were buried (nameless) on 19th November 1942. Of dreary sorrow is begun! And still I hate the sickly sun! And curse the hour when I was born! Dear Indian home, I sigh for thee! All the Lascar seamen listed below are commemorated on the Bombay/Chittagong Merchant Navy War Memorial. They have no grave but the sea. Thanks to George V. Monk and Peter Bird for the list below. The dates of death for the Lascar seamen are as noted by the Commonwealth War Graves Commission. They are factually incorrect, as far as is known, only one Lascar seaman from "CITY OF CAIRO" died on the 6th November 1942. Last update 24 March 2019.